Recently — in the most recent years, but especially in recent months — the debate whether Information and Communication Technologies (ICTs) empower or disempower, democratize a society or increase control over the citizen has been fuelled, both in the literature after appropriate research, and on newspapers, due to several events that have been read as turning points or milestones in the road towards the Information Society. As it is usual in almost any debate around the impact of ICTs on the society, equidistant opinions are rare and extremes are much more abundant. In this case, it is my personal opinion that both extremes apply, that is, that there seem to be two divergent but simultaneous trends towards empowerment and towards a decrease in the quality of democracy or, as I will be putting it, a decrease in the quality of democracy (understood as a loss of control over governance by the citizen). In the (sometimes difficult to avoid) trade-off between rigour and pedagogy, I have consciously chosen the latter in what follows. 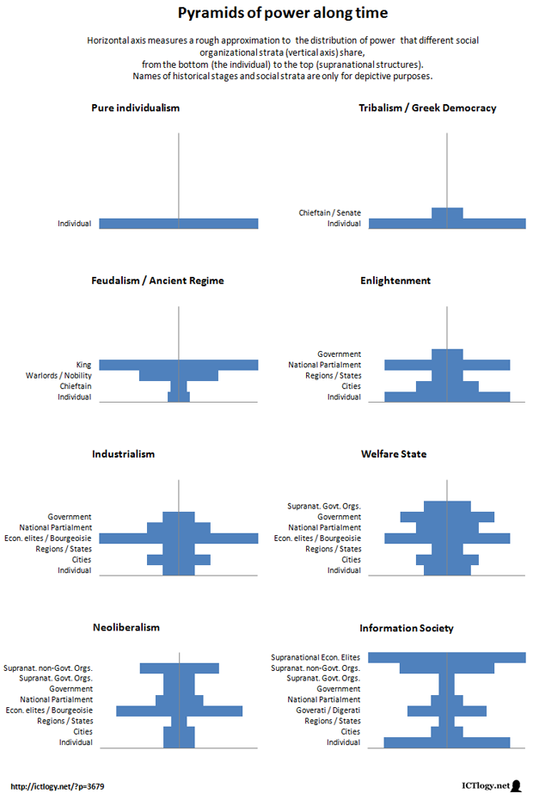 Many definitions are not very orthodox and most labels (and charts) are absolutely made up. I ask the reader for benevolence, forgiveness and, why not, the references that back (or refute) my arguments and that I was too lazy to look for. Empowerment: the capability to freely act and develop oneself within the system (very much in the line of Amartya Sen, 1980). Governance: the capability to rule and especially change the system itself (the institutional dimension of human development that, when in hands of the citizen, leads to effective democracy as described by Welzel, Inglehart & Klingemann; 2003). According to these definitions, we can describe, even in a very rough manner, how power distribution has been like during history. The image below pictures an approximation of this power distribution. We can consider than in very primitive societies, the individual held all the power. As social organizations became more complex, the need for a minimal coordination comes evident: tribes got their chieftains to guide the collective. An organized procedure to choose the chieftain is what ended up in Greek Democracy. So far, the idea is that both empowerment and governance remain in the individuals’ hands. The growth of communities and the need to strengthen coordination — especially against the “threat” of other communities — imply (amongst other factors) the militarization of a society and, sooner or later, the seizure of power by the military chaste. Warlords and absolute kings (and also Pharaohs, etc.) do not only rule but also reduce the degree of freedom of their subjects: governance shifts upwards while empowerment is drastically reduced. It is the ideas behind the Enlightenment and of modern democracy that pretend to give some power back to the citizen while keeping governance (increasingly important) in the hands of nation-wide institutions. It is within this framework that capital becomes more important as industrialization deploys over all aspects of life. Gradually, economic elites gain more power with two parallel effects: on the one hand, what Marx called the alienation of the working class, now reduced to a mere production factor; on the other hand, the possibility to directly or indirectly affect all matters related to politics and the public sphere so to shape it for their own purposes. Again, the pendulum swung back and the Welfare State came to correct both the loss of freedom (and protection) of the citizen and to take some control of the public arena by keeping for itself the management of the Economy (Communist states pretend to be doing that too). New at this stage, supranational governmental organizations are created to coordinate what goes beyond the national powers: a new layer of power is born. The strengthening of trend towards internationalization — ending up in sheer globalization — of the Economy has brought us in the past decades to a re-edition of industrialization, with the predominance of Neoliberalism setting the path of the Economy. Like industrialization, power shifts towards economic elites, but now split in two stages: the local and the global levels. Many claim that the Information Society is empowering back individuals, and it well may definitely be true: never before as now can people or people have the potential to freely act, create, speak, reach out… within the given system. But it may also true that, never before as now is governance — as the power to change the system — so far from the citizens’ reach… even of their direct representatives, which are controlled by higher powers, most of them out of anyone’s jurisdiction. Like in an hourglass, the distribution of power is shifted to the (upper and lower) edges, the question being: who is playing the role of the transmission chain between these two edges? Continues in: Empowerment and Governance in the Information Society (II): digerati, goverati and the role of ICT4D . Peña-López, I. 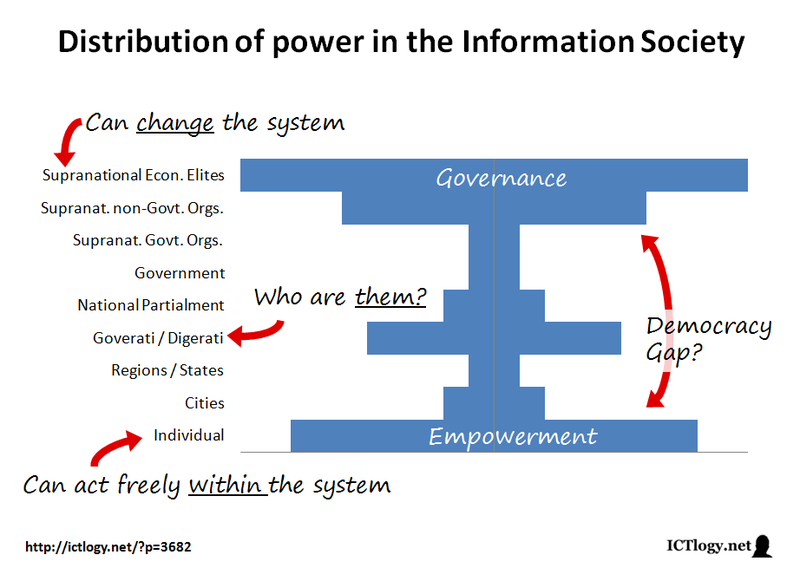 (2011) “Empowerment and Governance in the Information Society (I): the hourglass of information power” In ICTlogy, #88, January 2011. Barcelona: ICTlogy.